You know, I saw this one in its first airing and I still remember it. I don't remember the cloud or the coffee or any of the little touches that appeal to me as an adult. But I remember all this stuff about the animal guide. Wait, let me back up. The Cloud is the 6th episode in Season One. Voyager has an energy shortage and they hope to grab some by zooming into a nebula and scooping up some omicron particles. Things go wrong. They have to fix it. Along the way, Janeway wishes the crew had a counselor to talk to about their separation from earth and Chakotay mentions (of course) that he talks to his animal guide and offers to teach the captain to get in touch with hers. Eventually they set everything right and get on their way with less energy than they started with. I actually love this episode. It's fairly simple. There's no alien cast to deal with, no Delta Quadrant baddies trying to get all up in Janeway's biz. It's just this ship and this crew doing a very Voyager style mission. It shows early on that they can be scrappy and industrious without losing their moral bearing. It's like, have you ever been out of gas and had to scrape through the car, under the couch cushions, through your winter coat pockets, etc for loose change just so you could put enough fuel in the tank to get wherever you needed to go? I certainly have. And so has Janeway. Picard certainly hasn't. If Picard ran out of gas (or turned into a Borg drone and slaughtered thousands) he'd get a free pass from The Federation/Starfleet. I mean, I love Picard. I've written here many, many times about my undying love for Picard. I'm just saying, he's never pulled out of the garage that he didn't have a full tank, AAA, and the latest GPS. 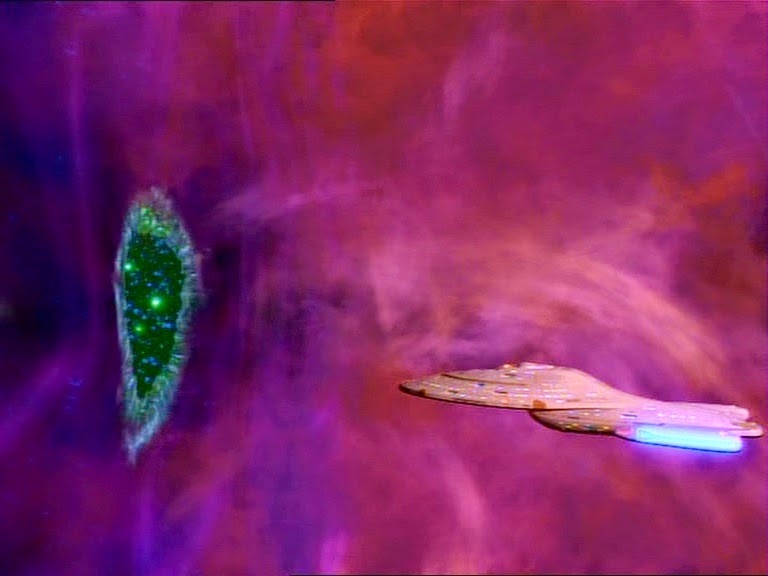 Anyway, my point is that The Cloud is a great example of what makes Voyager unique. They have no backup. They have almost no map. No one is coming to help them. They have to be industrious and creative and they have to do it all without being jerks. Which they do. In this one, when they punch a hole in the nebula and then realize it's actually a giant blob monster, they go back to fix it--at their own peril and expense. The Cloud also comes with the added bonus of watching Janeway attempt to find her animal spirit. Oh hell this woman is so earnest. As a kid, I was ALL OVER this scene. I've mentioned before that when Voyager first aired I was fairly adrift. I felt unsure of everything, lost. Like Janeway, I jumped on the idea Chakotay was pitching. "Yes!" I said. "I need an animal guide!" Sitting in my bedroom in Kentucky, I tried to do all the same stuff Chakotay walks the captain through but all I got was a replication of her scene. A beach. A rock. A lizard? (wouldn't it be hilarious if it had been a salamander?!?!) I mean come on. I could tell, even at ten, that this just wasn't working for me. I went on with my life without an animal spirit. But that's not to say I didn't take something spiritual from this episode or this series as a whole. I mean, I did learn to scrape through the couch cushions for loose change. Maybe that means Janeway was my animal spirit all these years. 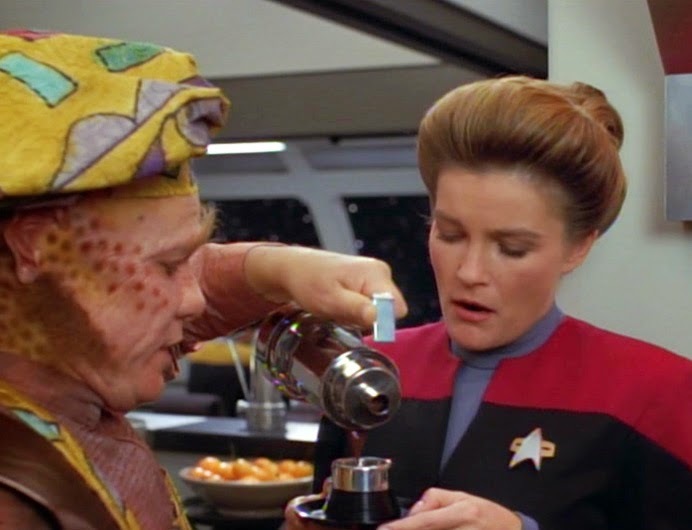 Other bonus points for this go to the first mention of Janeway's coffee addiction and her utterance of the actual phrase, "There's coffee in that nebula!" I also love that she talks about how she's always been comfortable with the distance normally kept between crew and captain but that she isn't sure it's going to work on this mission. It's not. Pretty much every senior officer will end up in her ready room spilling his or her guts to mom. That's ok, that's one of the other things that makes Voyager special. This episode also includes some classic "not giving The Doctor any personhood" moments which always drive me insane but is such a big part of the show. They mute him though. Seriously. Mute.